So Much More Than Grooming! Proper grooming has a positive effect on a dog or cat’s health as it not only improves their appearance and hygiene, but it can also increase their lifespan, improve their quality of life and, in some cases, actually save their life. Naturally, there needs to be at least some basic, daily grooming and brush-bonding for your pet. Not only does grooming make them look better, but it also teaches them many important behavioral aspects such as the soothing benefits of touch and being held so that they do not act out or bite. It also gets rid of dead hair, dirt and it distributes the natural oils from the skin throughout your pet’s coat, making them more comfortable, cooler and less itchy. Basic, daily grooming also helps cut down on mats which can be incredibly painful if they reach the skin’s surface. If mats aren’t dealt with immediately, insects can breed, sores can develop and even infection may form under the coat. Grooming is also an excellent and effective way to discover and assess any injuries, cuts, scrapes or abnormalities on the skin that may go otherwise unnoticed. Some of these conditions, particularly any unusual “bumps” that may be found on your pet’s skin or bones during grooming can actually become fatal if left untreated. A few of our partnering groomers have shared stories on how they were actually able to point out to the pet-parents potentially dangerous tumors or skin conditions that they noticed while grooming, PRIOR to a Veterinarian’s diagnosis. The pets in our home benefit every day from our basic grooming, love, treats, exercise routines, playtime and overall protection. 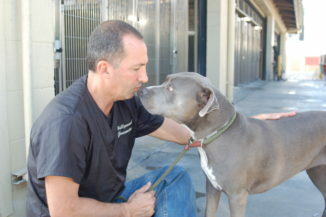 It is important to remember that sadly, not all dogs or cats in the Los Angeles area and the world over, are as lucky. Many of them wind up in shelters (having never even experienced human touch or the feeling of a loving home and owner). They have been abandoned, abused, neglected and their health and grooming has been completely neglected. Hollywood Rescue Grooming Foundation helps dogs and cats who find themselves in a shelter for one tragic reason or another, have a second chance at finding the perfect home through a permanent adoption or a foster. We (along with our partnering teams of volunteer professional groomers visit animal shelters with a fleet of mobile grooming vans to provide free grooming services, kisses and care for these abandoned animals. We provide them with hope and give them the same love and compassion that our own pets receive. Everyone deserves to be loved. 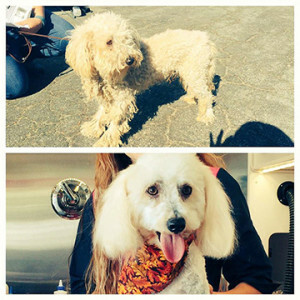 Life-Saving Grooming Makeover For JOEY! No donation is too small and it will help SAVE THE LIFE of a shelter animal in need.